LILONGWE, Apr 26 2013 (IPS) - Each night Esnart Phiri, a widow with five children, sleeps outside the gates of the state-run maize trader or Admarc market, in Malawi’s capital Lilongwe, as she waits for days on end to buy maize. Queues at Admarcs are never-ending as thousands of people wait for days to purchase the staple crop. Phiri told IPS that she puts her eldest child in the queue at night, in order to keep her place for the next day, while she sleeps with her other children in one of the office corridors across the streets. “The market has become my temporary home with my children because I have no energy to walk back and forth every day. I would rather sleep here and wait for the maize,” she said. Phiri is from Chinsapo Township, some 40 km from Lilongwe. This southern African nation has been hit by a maize shortage after two consecutive dry spells. Maize is Malawi’s most important food crop, accounting for 90 percent of all caloric intake, followed by cassava, sweet potatoes and sorghum. But, according to the Food and Agriculture Organization of the United Nations, Malawi’s cereal production for 2011/2012 was seven percent below the previous season’s harvest. Over two million people are facing food shortages this year due to the prolonged dry spells and soaring food prices that have pushed consumer inflation to 36.6 percent as of March. Phiri may not be willing to walk from Chinsapo every day, but each morning before the sun rises, a four-month pregnant Memory Jamesi wakes up and walks 40 km to the Admarc in Lilongwe. 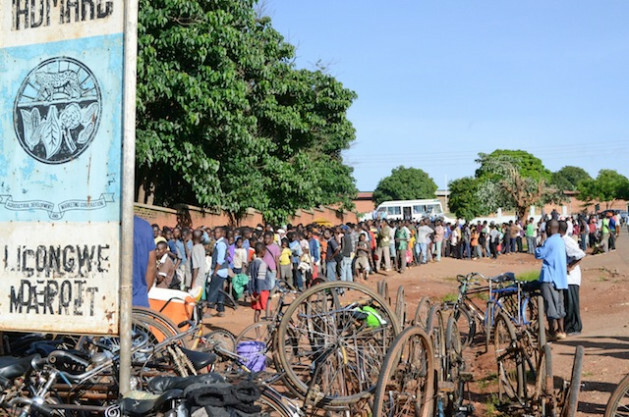 A few weeks ago the mother of three was so weak that she fainted while standing in the long Admarc queue. “I felt very weak and tired…I started shaking violently as I stood on the queue and I don’t know what happened after that,” Jamesi told IPS as she lay in her hospital bed in the over-crowded female ward at Kamuzu Central Hospital. But Jamesi’s plight is hardly unique. About five in 10 residents in Chinsapo told IPS their children have gone hungry over the last few months, not only because of the maize shortage, but because they cannot even afford to buy it when it is available. A 50-kg bag of maize used to cost around 13 dollars, but now the price has more than doubled to about 30 dollars – way above the earnings of those living in dire poverty, on less than 20 dollars a month. In a country where women make up 70 percent of the farming workforce and are the breadwinners in their families, women and children are bearing the brunt of the high food prices. The food situation has also worsened in the last two months, since about 30,000 metric tonnes of maize in the strategic grain reserves went bad. This, according to principal secretary in the Ministry of Agriculture and Food Security, Jeffrey Luhanga, was enough maize to feed almost 400,000 of the two million people in need of food aid. “The 30,000 metric tonnes of maize that went bad was enough to feed the masses up to harvest period. But now we have had to import 50,000 metric tonnes from Zambia to help fill the gaps,” Luhanga told IPS. This was the first time in six years that Malawi has had to import maize from neighbouring Zambia. From 2006 to 2011, Malawi reaped bumper harvests of maize because of a successful fertiliser subsidy programme. Under the programme, which started in 2005, the poorest farming families are given a 40 percent reduction in the cost of fertilisers and seeds. It worked well for Malawi. In 2003, the country adopted the Comprehensive Africa Agriculture Development Programme (CAADP), which aims to help eliminate hunger and reduce poverty. But the two consecutive dry spells and corruption in the distribution and supply of fertiliser for the subsidy programme have cut the bumper harvests and affected yields. “During the last two years under the administration of (late president President Bingu wa) Mutharika, the fertiliser inputs subsidy programme was corrupted and the targeted families did not benefit because fertiliser was diverted. Secondly, two droughts, especially along the country’s maize belts, affected the harvests,” Luhanga said. However, Minister of Agriculture and Food Security Peter Mwanza told IPS that the coming harvest was expected to be a strong one thanks to good rains. “Our first crop estimate shows that we expect to harvest 3.5 million metric tonnes, which is more than what we harvested last year,” Mwanza said. The initial harvest being forecast is more than the national requirement of 2.8 million metric tonnes.